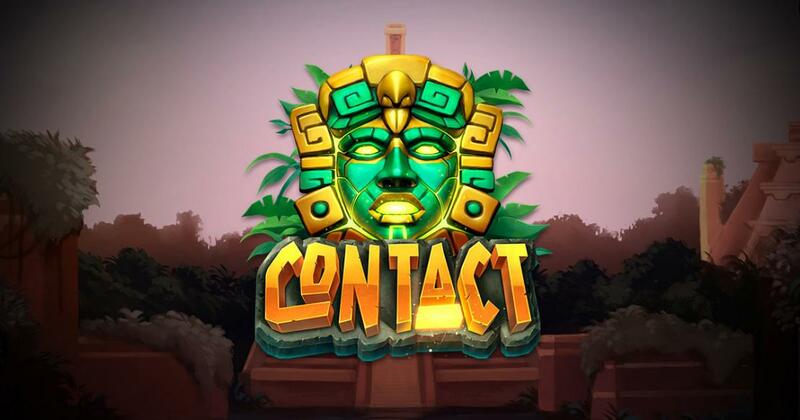 Contact is a Play’n GO slot, which might sound like it has an alien story, but it’s actually inspired by the Aztec civilization. Contact is an interesting game in more ways than one, featuring a unique layout, Avalanches and other goodies, while keeping the win potential fairly high as well. If the theme/design are of interest to you in a slot, I’m sure you will be happy to hear that the graphics are decent here, and the layout is unique enough to make things interesting for you. Expect to find a big game area, with a total of 35 symbols visible on the reels. They’re all inspired by the Aztecs in some way. Some symbols have representations of the Aztec gods, others have images representing birds, monkeys, snakes, turtles or predators of the jungle. They’re all turned into square blocks of stone, which fit on top of each other, between two pillars which appear to be part of a temple. For Contact, the developer has chosen to rely on 5×7 reels and they’ve used a Cluster Pays system to create winning combinations. The top wins of the slot will reach 151,750 coins, which means only 1517.5x the stake. Despite the average payouts, this is a slot with High volatility, and an RTP of 96.55%. Several bonus features are in place, along with reel modifiers. The wager gets set up with 100 coins in it, and it will have a total value for you to pick, between $0.20 and $100. The wins that you’re going to form in Contact will be created through clusters of 5 or more matching symbols. You get a set payout for each symbol that is part of the cluster, differentiating based on the type of icon that is used as well. As you fill up the game area, and you get closer to the top, multipliers will start being applied to wins, as high as 4x for the 6th row. Once you get to the top with your symbols, you trigger a bonus feature with 3 free spins in it. Up to 5x multipliers will be available here, and filling up the reels with symbols is easier then. The Super Bonus Round is also part of the game, triggering with 6 spins when you get the grid filled with winning icons. Contact doesn’t pay quite as well as I wanted, given its High volatility, but I did enjoy the unique features which it introduces, so you might want to try it for that side of it. Try of out a demo version of Contact.